These four musicians recorded three very different records together under three different group names. Flea On The Honey was the first of these, recording an album for the RCA subsidary Delta Records in April 1971. All lyrics to the 10 tracks were sung in English and the group members even adapted English names on the sleeve! The material was very variable, indicative of a group that hadn't yet properly decided its musical direction. Most of it is strongly influenced by late sixties British rock highlighting guitar and organ (Spooky Tooth, Traffic, Raw Material, Deep Purple and many, many more) and it ranges from progressive gospel rock ("Mother Mary") and folk-rock ("Louise") to forceful guitar-based heavy-rock ("Moon Park Woman") and blues-rock ("Face To The Sun"). It's quite a good album, although not indispensable. 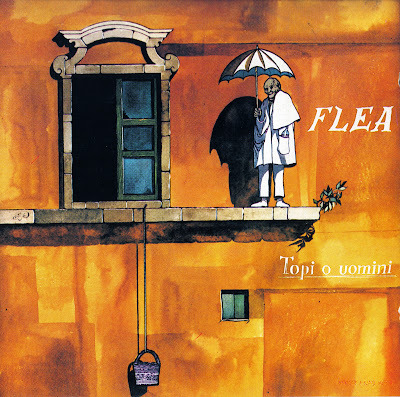 Changing their name to Flea, a more powerful direction was developed for Topi O Uomini (1972), a classic album for guitar lovers, which showcased some really excellent musicianship. The pinnacle of this was the 20-minute title track that went through several different phases, starting with jazzy percussion and a memorable guitar riff, then introducing chords for the great vocal passage that follows. After some great guitar variations there is a sudden shift to Black Sabbath-tempo heavy rock introducing another melody. This is developed and varied in shifting dynamics with further strong guitar work and vocals. The third and last melody part starts after a short drum solo after 14:56 minutes and is closer to the blues with the addition of harmonica. After a short time this leads into another drum solo, gradually resurrecting the first melodic theme of the song. The reasons why this composition works so well are a superb rhythm section and an almost violent enthusiasm from all those involved. The remaining three tracks are also quite powerful, with only "Sono Un Pesce" being indicative of the softer moments of the previous album. In 1973 Flea split for a while, leaving Elio Volpini time to join L'Uovo Di Colombo for their great album. A couple of years elapsed before the quartet assembled again under the name Etna. This time they recorded a powerful instrumental fusion album fronted by guitar and electric piano, resembling Mahavishnu Orchestra or the Spanish group Iceberg. The spontaneous enthusiasm was exchanged for cold and studied intellectualism, although this is not a bad jazz-rock album.